14 Day free trial of Complete Plan. The genealogy service MyHeritage launched in 2003. 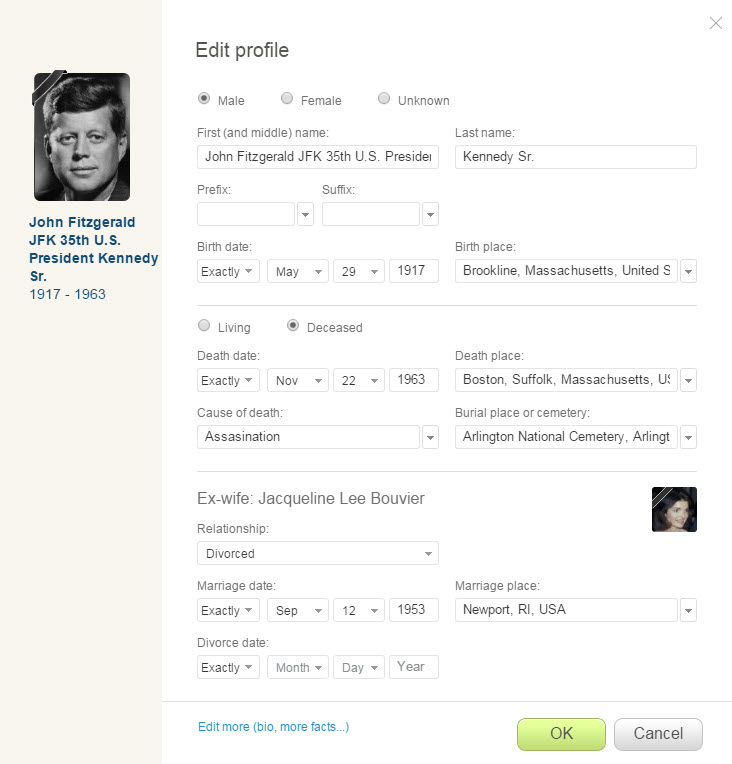 It allows users to create family trees, upload photos and browse through over 8 billion historical records and pictures. MyHeritage provides you with the search and research tools to comb through the records in-depth to learn more about your ancestors. 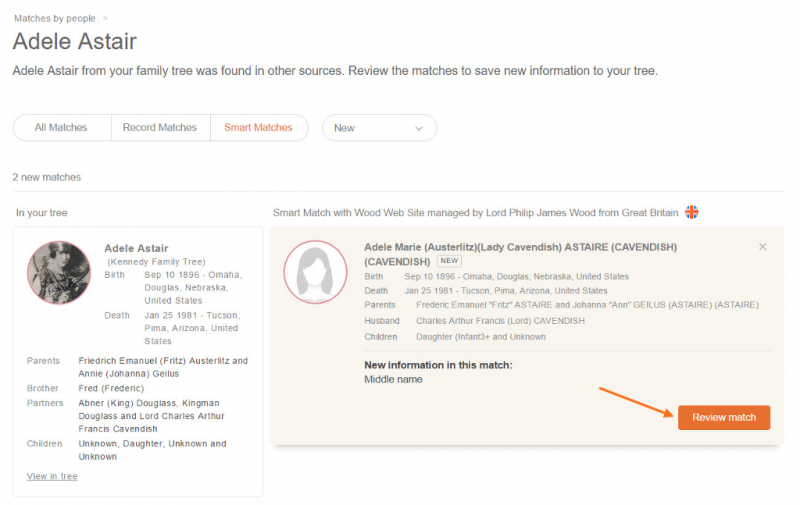 Once you have started your family tree and entered a few members of your family, MyHeritage begins automatically searching their records alerting you via email when it finds new family tree connections. These connections could be census records, travel documents, newspaper articles, or other record types. You can access the MyHeritage service a number of different ways. The easiest way to start is via the website MyHeritage.com. Once you have created a free account you can setup your family site. The free version allows you to add up to 250 people (plus other restrictions) and allows you to really see how to use the tools provided and overall understand how MyHeritage works. If you like what you see you can then consider one of the subscription plans which allows access to more record collections, larger family trees, and more storage space (for photos). MyHeritage can also be accessed with an app via your tablet and phone. Stand alone PC software called Family Tree Builder is also available which allows access to the MyHeritage records. As of 2017 MyHeritage has more than 8.2 billion historical records including birth, marriage, death, burial, census, military, legal, immigration, newspaper, and yearbooks. There are also other types of records, plus digital scans of the original documents. 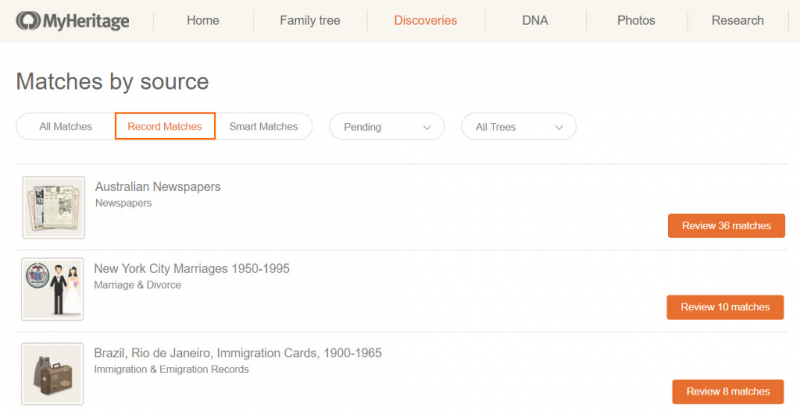 MyHeritage records are broken down into categories and with in those, collections. There are more than 6,500 collections. Popular categories include "Census & Voters Lists", "Family Trees" (these are other members public trees), and "Birth, Marriage & Death". Within "Birth, Marriage & Death" you could find for example collections like "Texas Marriages and Divorces" and "Texas Births and Christenings". Collections can belong to more than one category and can be refined by location and by a year range. 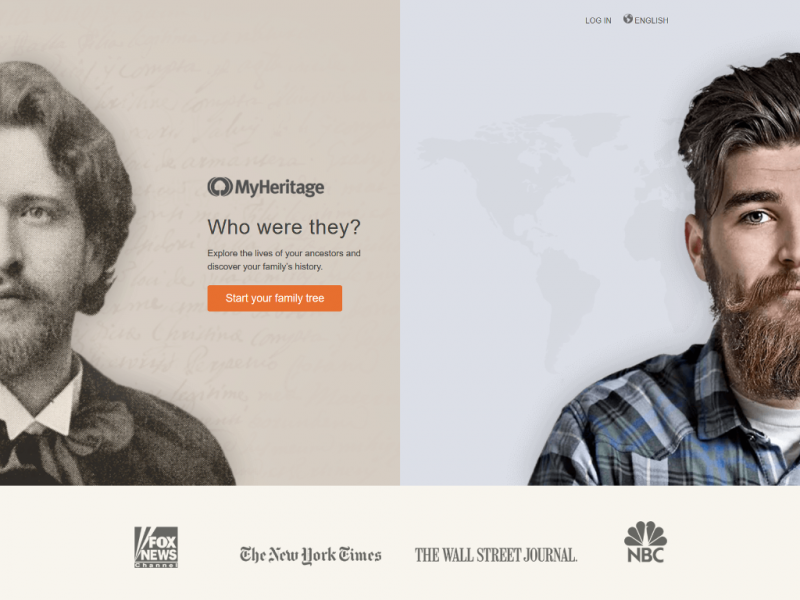 MyHeritage continues to add to their database of records on average 200 million records every month. All these records may seem overwhelming but MyHeritage has numerous tools to help you find the information you need for your family tree. To access ancestry information provided by the MyHeritage community of users you can perform searches on the following MyHeritage collections: 'MyHeritage family sites', 'MyHeritage members', 'MyHeritage family trees' and 'MyHeritage photos'. To find out more about a user you can also visit the homepage of their public family tree site. Here you will find a description about the person, his family tree, photos, and other statistics. From here you can also contact the user if you just want to introduce yourself or have any questions for them. You have complete control of all information you enter on your MyHeritage site of who can view it and who cannot. You only share what you want. MyHeritage also has a community genealogy forum that is used for sharing family history information with other users. The forum topics are split into different categories based on location, surnames, and other genealogy related topics (like Adoptions, Cemeteries, Newbies, Family Reunions, Occupations, etc.). A basic family site (your family tree) is free on MyHeritage. There are also 4 paid subscriptions plans offered called Premium, PremiumPlus, Data and Complete. A 14 day full free trial of the Complete plan is available to new members. * Prices usually based on monthly subscription. Prices may increase/decrease depending on subscription length or country. All prices in USD unless specified other wise. Costs and features offered last checked November 03, 2017. MyHeritage has a really in depth customer support system. The Help Center has many articles that contain images and detailed descriptions on how to use the genealogy service and find the history records you are looking for. These articles are organized by category (like "Account & Settings" and "Discoveries & Research") and also offers a search function where you type in your question and the articles which most match your needs are returned. The quickest way to reach customer service is by a toll free phone number. Each country has a different number and support hours may vary. If your question is easier to explain in a message then you can send them an email as well or use the support forums. The support forums allow you to post your question and have other MyHeritage members and/or customer service reps answer. Launched in 2016 MyHeritage DNA is a service that analyzes your DNA to help uncover your ethnic origins. The purchase of a testing kit and a saliva sample is all that is needed and in 4 weeks or so you can find out a lot more about your ancestors. Reports from MyHeritage DNA includes the ethnic groups of your relatives and geographic regions they originated from. You can also find new living relatives you never knew you had by using the DNA matches tool. For more information on this service you can read our MyHeritage DNA review. Family Tree Builder - Genealogy software which allows the user to build family trees, upload photos, view charts and statistics. You can sync your Family Tree Builder information with the MyHeritage service. Was it easy to find what you where looking for? I am not a paying customer yet. I have been using Myheritage to create a family tree. I have about 50 people in it so far and I think I need 200 before I need to subscribe. I had a question on how to do something so I called Myheritage customer service about separating my family tree completely from a cousin of my husband. The rep I got was named Sam and he was great. He emailed me very detailed instructions on how to do it. What was really nice (and what I was dreading) was he made no attempt to try to sell me to paid subscription. In a few minutes I got everything I needed to know. If I continue to use Myheritage as much as I have been in the last few weeks I will probably go ahead and purchase a subscription. So far I have been really impressed.